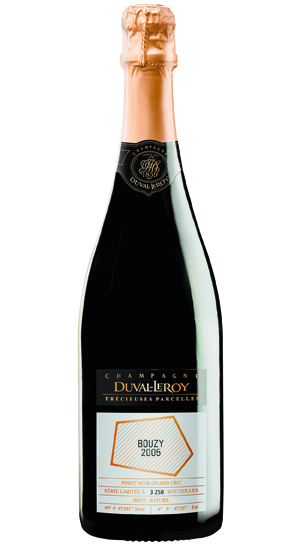 The passion of Duval-Leroy for authenticity is demonstrated in this cuvee made only from Pinot Noir. This Blanc de Noir cuvee comes from the Grand Cru Village of Bouzy, located in the Montagne de Reims, with a limited production quantity of 3,258 bottles. From the 2005 vintage, this wine for the true connoisseur releases a powerful bouquet, at once both balanced and complex. This aroma is distinguished by the concentration of Pinot Noir vinified entirely in oak barrels to give it power and elegance. It shows a yellow colour speckled with gold. A product of the close relationship between the vines and the sun, and a profound observance of nature, this wine causes a liveliness mixed with smooth and warm touches behind a well-balanced depth to explode in the mouth, giving pleasure to connoisseurs and lovers of distinctive flavours. Aromas of brioche, biscuits and crystalized fruits will delight the keenest lovers of champagne. Its depths of flavour will express themselves with a veal chop with lightly salted butter and duck foie gras.